Make weeknight dinner easy with this one-dish meal that requires little cleanup because you cook the whole dinner in a foil packet. Be sure to use heavy-duty aluminum foil so the barbecue sauce does not leak out of the packets. Place a foil sheet, approximately 12-x-12-inches, on a work surface. Spoon about 1 teaspoon of the barbecue sauce in the center of the foil sheet. Place one chicken breast half over barbecue sauce and spread another teaspoon of sauce over chicken. Top with a quarter of the potato, bell pepper and onion. Sprinkle with a little of the salt and pepper. Fold foil in half to cover the contents; make narrow folds along edges to seal. Repeat with remaining ingredients to assemble three more packets. Place packets on a baking sheet and bake for 35 minutes. Open foil packets with scissors and carefully pull back edges (contents may be very hot). 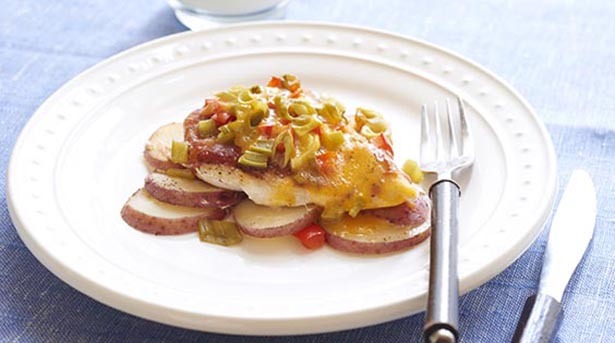 Sprinkle a quarter of the cheese over the top of each chicken breast half and return to oven, unsealed, for 2 minutes or until cheese is melted. With a spatula, transfer the contents of each packet onto individual serving plates, if desired.